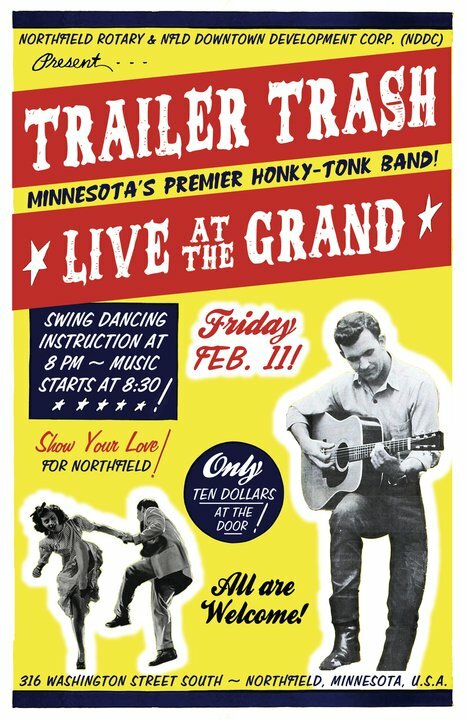 Minnesota’s premiere honky-tonk band, TRAILER TRASH, will perform live in concert on Friday, February 11 at The Grand Event Center in historic downtown Northfield. Presented by the Northfield Downtown Development Corporation (NDDC) and the Northfield Rotary Club, the event is open to the public. Admission is $10 at the door. Doors open at 7:45 p.m. with a swing-style dance lesson and demonstration presented by the Carleton College swing-dance club, The Rugcutters, at 8 p.m. TRAILER TRASH takes to the stage at 8:30 p.m. The six members of TRAILER TRASH enjoy turning new generations on to the classic sound of American roots music. Their contagious enthusiasm and obvious enjoyment onstage have earned TRAILER TRASH the reputation of being Minnesota’s premier honky-tonk band. Little Christmas Show. The band has provided the soundtrack to hundreds of Twin Cities courtships and wedding receptions. Somewhere during it all, the group has also racked up seven Minnesota Music Awards, appeared in two movies, and put out six albums. The band’s website can be found at www.trailertrashmusic.com. For more information about this event, visit www.nddc.org or www.northfieldrotary.org. The Grand Event Center is located at 316 Washington Street South in downtown Northfield, Minnesota.